Alibaba has set new sales records on November 11 for its biggest shopping day, the annual Singles Day. The Chinese internet giant hit a record $1 billion in sales in 85 seconds, and then just shy of $10 billion in the first hour of the 24-hour spree. In total, customers spent $30.8 billion, up 27% on last year, but the lowest annual increase in the history of Singles Day. Online discounts have been offered on 11.11, Alibaba’s informal holiday for singles, since 2009. Alibaba Group chief executive Daniel Zhang said the spending bonanza demonstrated “customers’ continued pursuit to upgrade their everyday lifestyles”. Singles Day was kicked off on November 10 with a gala featuring Mariah Carey, a Japanese Beyoncé impersonator and a shoe-shopping-themed Cirque du Soleil performance. Alibaba invented the sale event to celebrate the unattached as an antithesis to the romantically involved on Valentine’s Day. 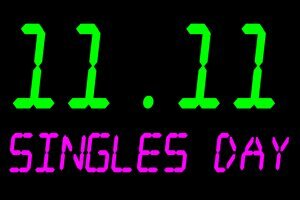 According to Bloomberg, Singles Day is now the world’s biggest online sales event and this year’s total was more than Black Friday and Cyber Monday’s totals combined. Some 180,000 brands are available in the shopping blitz, including top technology companies Xaomi, Apple and Dyson. In 2017, Alibaba expanded the event to the Western market, with downloads of its app AliExpress surging in the US and UK. The shopping frenzy has broken world records in e-commerce sales – surpassing last year’s record at 17:34 Hong Kong Time. However, observers believe as the event matures, its growth rate will slow down. This year Alibaba has also faced new challenges, such as new rivals in the market, a slowing economy and its stock dropping 16% thanks to China’s trade war with the US. The November sale event is expected to be founder Jack Ma’s last at the helm of Alibaba. The current chief executive will take over as chairman in 2019, Alibaba announced in September.